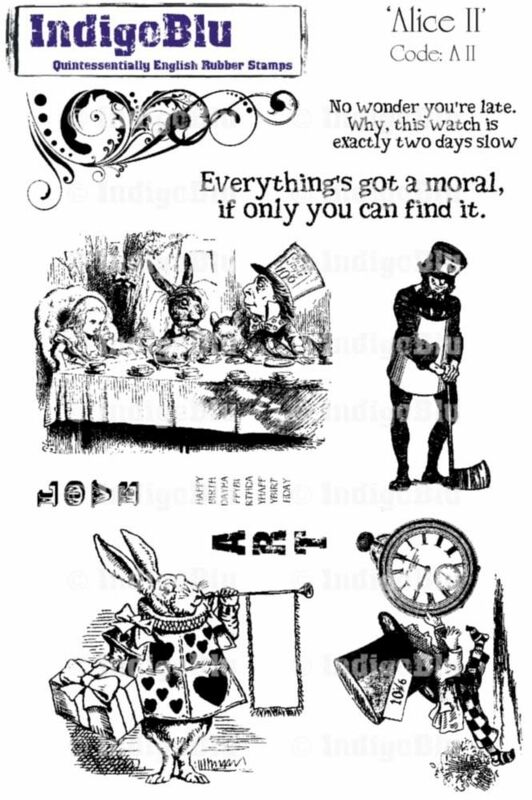 Stamp till U Cramp: The Altered Alice CHAPTER 8 Challenge - Week 5: Celebrating the Mad Hatter, with Twinkles! The Altered Alice CHAPTER 8 Challenge - Week 5: Celebrating the Mad Hatter, with Twinkles! At The Altered Alice we celebrate Mad Hatter's Day twice a year as the date is taken from the price on his hat - ten schillings and a sixpence or 10/6. That means it is on October 6 here in the United States, and on June 10 in the United Kingdomcelebrate the Mad Hatter, and as OPTIONS you can use something that twinkles or shines AND/OR you can bring some spookiness into it since we are all having a "Twinkle twinkle little bat" sing-along around our mad tea table! Our prize this month is an A5 sized unmounted stamp set from IndigoBlu (a £13 value), or an equivalent amount of A6 stamps. 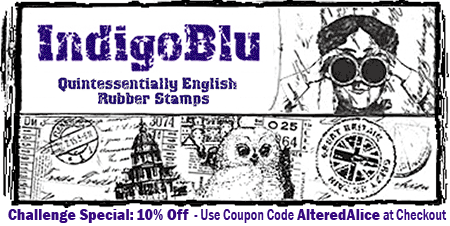 IndigoBlu is a fantastic new British stamp company that makes "Quintessential English Rubber Stamps" right there in England. 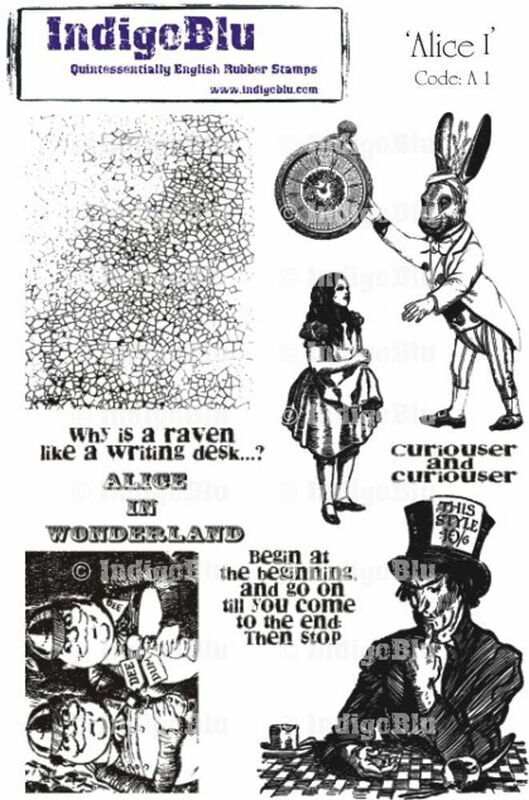 In fact IndigoBlu is sponsoring The Altered Alice for October AND November, and the design team will be working with these two fantastic Alice stamp sets, titled appropriately "Alice I" and "Alice II". Most Americans don't know what A5 and A6 mean so I'll just tell you, these sets are huge! I encourage you to go visit IndigoBlu.com. All stamps are on sale right now with their introductory pricing, but that won't last forever, and the designs are all wonderful! In addition, the Head Honcho Alfie says The Altered Alice readers can take 10% OFF during the challenge; just use coupon code AlteredAlice in the voucher code box at checkout! Thanks Alfie!